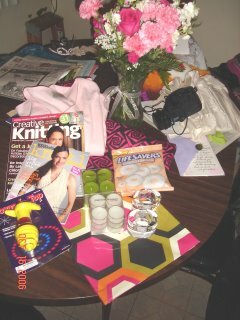 KnitGyver: It's my Birfday...yea--I said "birfday"--gotta problem with that?? It's my Birfday...yea--I said "birfday"--gotta problem with that?? 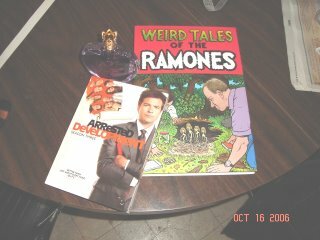 I'll start with the gifts I got from the old man and the kids...T got me Season 3 of Arrested Development (RIP), and you can't see it that well in the picture--but he also got me a bottle of Vera Wang "Princess" perfume. It smells great!! The Ramones set was from my almost-10-year-old son. It's got an almost full library of their songs and a DVD full of interviews and videos. Funny story about this: Back in August, we were shopping for T's b-day, and I saw this. I picked it up and and told KeKe that this would make a great birthday present for me. Well, he actually remembered--which wouldn't be so strange, because he remembers alot of weird stuff--but this kid can't remember that I asked him to put his backpack away 5 minutes after I ask him. Hadzilla's present is not pictured--it's just a cute pair of pants...and some candy that has long since been eaten! Anyway, Family, I thank you for the super-great gifts. I'm still expecting a couple more packages, so when T gets back on Saturday with the camera, I will be sure to post again. So how many whoopin's did ya get? That is soooooo sweet! You so scored! 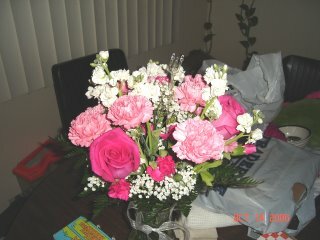 And pink flowers! You are the princess! Im so glad that you had a good one! I must say that im a little shocked that kegs is getting so old!